This study from Genesis to Revelation will help answer the question, What is a Christian view of work? It explores issues such as ethics, success and prosperity, creative rest, the value of homemaking, and meaningful ministry. Discovering God's design for modern-day work in the Scriptures is not simple because a new set of satisfactions exist today. Today jobs must be meaningful, appropriate to a person's talents, continually challenging, and adequately remunerated. 13 studies for individuals or groups. Satisfying Work: Christian Living from Nine to Five by P. Stevens;G. Schoberg was published by Waterbrook Multnomah in March 2000 and is our 48439th best seller. 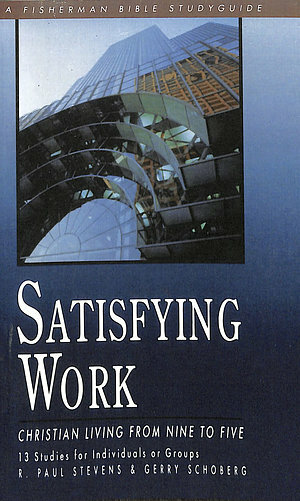 The ISBN for Satisfying Work: Christian Living from Nine to Five is 9780877887522. Be the first to review Satisfying Work: Christian Living from Nine to Five! Got a question? No problem! Just click here to ask us about Satisfying Work: Christian Living from Nine to Five.